1994 was a banner year for top-notch 16-bit platform games. Donkey Kong Country, Earthworm Jim, The Lion King, Sonic 3 and Sonic & Knuckles, The Jungle Book, Sparkster, and Dynamite Headdy all drew a lot of attention, among others. Sony Imagesoft’s Mickey Mania: The Timeless Adventures of Mickey Mouse was also well-received, even though its following seems somewhat smaller than that of most of the games I have mentioned. 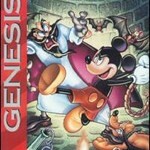 The considerable hype surrounding Mickey Mania mainly had to do with Disney’s participation in the making of the game. There had been many Mickey-themed titles before this one, but those were designed by non-Disney companies (usually by Capcom). I remember renting Mickey Mania back in 1994 and liking it, but I did not buy it at the time (unlike Donkey Kong Country, Earthworm Jim, The Lion King and The Jungle Book). When I bought a used Genesis a few weeks ago, I wanted to give the game another try, and did not regret it. Mickey Mania‘s inventive and uncommonly challenging gameplay makes it an excellent action game and warrants a purchase. Disney’s participation fits in well with Mickey Mania‘s central theme: Mickey’s history as a cartoon character. The game cleverly revisits six specific short films – Steamboat Willie (1928), The Mad Doctor (1933), Moose Hunters (1937), The Lonesome Ghosts (1937), Mickey and the Beanstalk (1947), and The Prince and the Pauper (1990). Each cartoon is broken down in individual sections, which amount to 25 overall. The structure keeps the cartoons’ chronological order, and this creates a slight imbalance: as an example, the second level has eight sections and is a lot harder than the third level, which only has two. But the insights of chronology and the brilliant level design amply justify this. The Mad Doctor level is one of the most exceptional I have yet witnessed. Each of its eight sections introduces new challenges: a collapsing bridge; a rotating tower (the effect pushes the Genesis to its limits); skeletons whose bones fly all over the place; swinging ropes; confinement in an elevator; the mixing of a potion… all of these scenes make the level a work of art in itself. The unique play mechanics do not end there: you race a moose in a front-view perspective (level 3), you get to ride floating barrels (level 4), make plants grow (level 5), and use books to your advantage (level 6). Although a few secrets are to be found in some of the stages, Mickey Mania is not an exploratory action game in the mold of Earthworm Jim: its sections are mostly linear and only one path leads to the exit. Such a game relies a lot on the quality of the level design, and Mickey Mania‘s is remarkable. The designers drew inspiration from the original cartoons and ingeniously transposed these works in a gaming environment. Each level has been so meticulously thought out that there is no filler or repetition to be found. The only drawback is that some areas end too soon. The graphics are as good as one could possibly hope for. Unlike a game like Donkey Kong Country, Mickey Mania is not well served by out-of-context screen shots: its beauty can only be experienced through the fluidity of the gameplay. Ultra-smooth animation has been given not only to Mickey himself, but also to his enemies and the moving objects that fill the various areas. Textures range from the spare black and white of Steamboat Willie to the sun-drenched atmospheres of Moose Hunters, the barely lighted sequences of The Lonesome Ghosts, the naturalistic Mickey and the Beanstalk, and the magical books of The Prince and the Pauper. Striking 3-D effects can be found in the rotating tower segment of level 2 and the very beginning of level 4. In the Super NES Mickey Mania, players have noticed that an annoying segment of Mickey looking at his watch appears between the stages to cover up loading time – there is no such delay in the Genesis version, and the successive areas flow seamlessly in one another. In many ways, the music is unDisney-like in its restraint and subdued effectiveness (this is a compliment). It is played at a low level for most of the game. Two of my favourite themes are the Mad Doc 4 an Tunnels music from the sound test. The sound effects are adequate and the sampled voices are fairly clear for a Genesis game. The controls are limited to the D-pad and two buttons for jumping and shooting. You can gain ‘ammunition’ by collecting marbles scattered in the levels; most enemies are eliminated when you jump on them. Power-ups are few and far between, but the jump-and-shoot action is expanded by a proliferation of changing perspectives, which require widely different talents. The play control itself is solid and responsive. The hit detection is merciless however, and this enhances the difficulty of parts in which Mickey is either surrounded or has to hit precise spots when jumping. With its numerous sub-levels and vast array of techniques, Mickey Mania offers a challenge that is as unexpected (given its theme) as it is welcome. You can’t run through stages and finish the game in fifteen minutes: the trials just keep coming, and the last three cartoons are especially difficult. Furthermore, health is not restored when you move on to a new area or cartoon; yellow stars do give back one life point each, and are fairly easy to find. As for 1-Ups, they are sparse and cleverly placed in the levels. There are three difficulty settings, and you can choose between three to five lives (the default setting is normal/four lives). The levels’ variety and the game’s overall smoothness is such that the lack of a password feature is not a weakness. No two settings are the same, and all the levels can be played again and again, even after you have mastered their hardest parts.